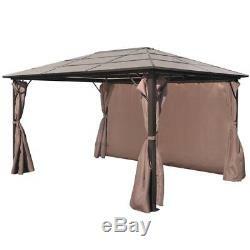 VidaXL Gazebo with Curtain Garden Shelter Tent Canopy Brown Aluminium 2 Sizes. Here we offer you 2 sizes to choose from. 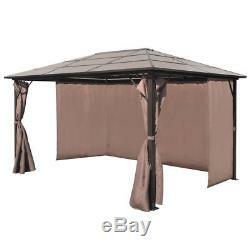 This gazebo with curtains features a classic and elegant design. 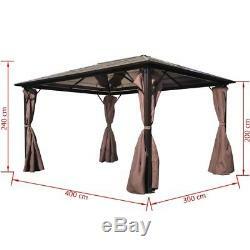 It will make the perfect sunshade shelter for outdoor events, such as dinners, BBQs, family gatherings and so on. The roof, made of 6 mm thick UV-resistant PC board, guards you from the glare and harmful UV rays of direct sunlight. 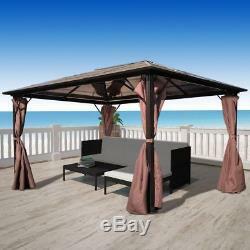 The canopy is solidly constructed from strong aluminium, and is therefore extremely resistant to rust and very stable. The pavilion is delivered with 4 side walls equipped with zippers, which can be drawn in bad weather. Velcro straps are also included for easy attachment of the curtains. 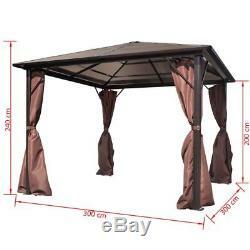 The gazebo can be easily fixed to the ground with the included fixing accessories. Total size: 300 x 300 x 240 cm / 400 x 300 x 240 cm (L x W x H). PC board thickness: 6 mm. Including 4 sidewall curtains with zippers. Eave height/scroll height (where people can walk under): 195 cm. Excluded areas: Channel Islands, Isle of Man, Isles of Scilly, Scottish Highlands and Scottish Islands. Our customer service will be happy to help. We look forward to your positive and detailed review with 5 stars. 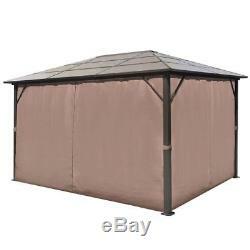 The item "VidaXL Gazebo with Curtain Garden Shelter Tent Canopy Brown Aluminium 2 Sizes" is in sale since Sunday, July 16, 2017.